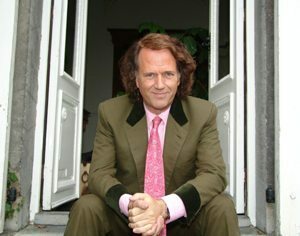 The highly respected and ever prolific Dutch violinist André Rieu, a great friend of the lateMOR genius James Last, is Maastricht’s most famous resident. 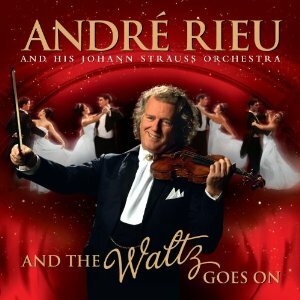 A global traveller with worldwide successes to match his output Rieu is known for creating the waltz-playing Johann Strauss Orchestra whose popularity matches or exceeds many a rock and pop phenomenon when it comes to stage performance. 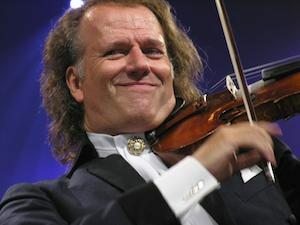 One of the violinists who deserves (and can afford) to play a Stradivarius, Rieu owns the 1667 model, one he has often compared to the female form. As he says: “It’s not only a Stradivarius, it’s THIS Stradivarius. A violin is really like a woman. She is unique. There are many women but only one woman you love. With a violin it is the same.” He spent much time searching out his instrument. “Yes, it is really difficult until you get entrance into the violin world…. It’s a small world; only 3 or 4 people determine that over the whole world. 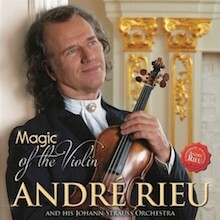 And once they knew that Andre Rieu was looking for a violin and preferably a Stradivarius. They came like flies to honey. It was unbelievable; I did nothing. They came from the other side of the world with violins saying: come, play. 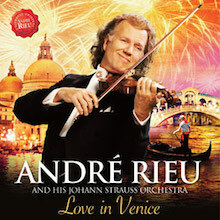 I actually had many different Stradivari under my chin to try out but it was very difficult because it is such a important decision.” As one of modern classical music’s genuine superstars Rieu hasn’t always been able to satisfy those critics who would keep the great composers of the Baroque and Romantic movements covered in aspic and under glass in dusty museums, but since this man weighs his royalties rather than read them on a spreadsheet, he should care less. Still often playing over 100 concerts a year, the youthful 65-year old and longhaired figure he cuts is so charismatic that he is viewed with awe by his fans: from Holland to Germany and London to New York, they flock to his concerts with tribal fervor. 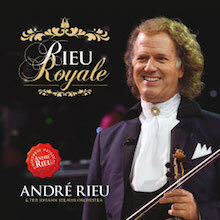 Heavily honoured in Holland and also in France (he is a Knight of the Ordre des Arts et des Lettres, Rieu has done more than most to rescue classical music from a time warp and bring it to modern tastes. He is also canny enough to mix theme music, movie soundtracks and golden pop standards of the 20th and 21st centuries into his repertoire. Music maestro, please. 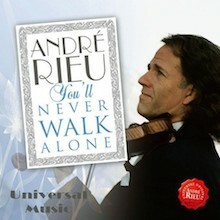 Coming from French Huguenot stock Rieu also hails from a highly trained musical family. His father was conductor of the Maastricht Symphony Orchestra. A fascination with the orchestra and a burgeoning brilliance as a violinist and conductor took André to the Conservatories in Belgium and Holland. He formed the Maastricht Salon Orchestra as a small enterprise in the 1980s but saw no reason to limit his ambition. The Johann Strauss Orchestra and the formation of his own production company took him into the stratosphere long before the moguls of R&B and Hip Hop realised that diversification was the name of the game. Specializing in the waltz revival, he has become known as the “Waltz King” (a title originally bestowed on Johann Strauss 11). 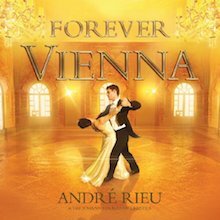 Since the orchestra expanded so did Rieu’s repertoire and he includes all forms of crossover and makes an art form out of easy listening. 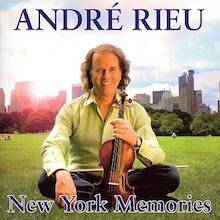 Having released almost an album a year since 1982 Rieu’s full achievements would need a tome or five to do them justice. Suffice to say he has been well described as a phenomenon. He’s Pavarotti, the Boston Pops, Nigel Kennedy, Liberace and PT Barnum rolled into one. He’s a heart-throbbing chart-topping star of the Morning Melodies set whose popularity puts the Three Tenors to shame. 1985’s La Belle Époque is a good place to pick him up since he tackles music by Haydn, Gustav Langer and Kalman. Such eclecticism is the name of the game with Rieu and Eine Kleine Salonmusik (1987) offers a quintet delving into Mozart, Zercvo and Saint- Saëns. Strauß & Co and 1995’s Wiener Mélange find the man entering his first truly famous phase. 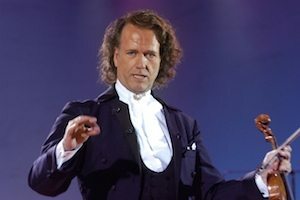 The live In Concert and Stille Nacht confirmed his status while Romantic Moments, Bal a Vienne and the huge seller André Rieu und Das Johann Strauss Orchestra gave him international prominence. What began as a European affair suddenly blossomed into word of mouth fame that spread from the UK to the USA. So it goes: La Vie est Belle, Dromen, Tour D’Amour and Heartstrings elevated the profile again with telling interpretations of “Tennessee Waltz”, “My Heart Will Go On” and the evergreen “Memories” marking him out as a connoisseur of popular crossover classical who knows how to press the public’s buttons. The epic Romantic Paradise really pulls out all the stops as it covers Morricone’s “Once Upon in The West”, “The Girl from Ipanema”, “The Godfather”, “La Paloma” and “Blue Spanish Eyes” with playful fervor. A return to his classical roots makes Die Welt der Violine – Ein Himmel Voller Segen (2003) an authentic and integrity filled release that we heartily commend for discovery. This is no po-faced and fusty take on orchestral crossover but a joyous, tune filled mélange that pays homage to melody and still dazzles with technical virtuosity. A rare skill. Hoping we’ve whetted your appetite let our free flowing fiddler with the bouncing bow introduce you to his Australian odyssey, Waltzing Matilda, the neo-classical masterpiece In Wonderland and Rieu Royale, one of his most fetching romantic outings. 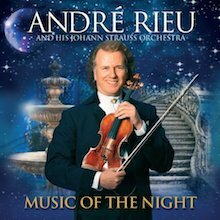 Music of the Night is an essential Rieu recordings. The latter has a bonus set where he celebrates ABBA! What’s not to like! For superlative compilations (there are many) try his Top 100 or Love Letters where Nino Rota, James Horner, Cole Porter, Elgar and Grieg co-exist in perfect harmony. 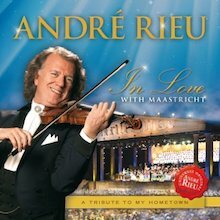 December Lights is his definitive Christmas anthology while The 100 Greatest Moments offers a rounded assembly of everything Rieu does so well, from Gypsy songs and polkas to the evocative strains of Louis Armstrong and Judy Garland chestnuts. One of our all-time favourites is And the Waltz Goes On (2011), the Classic Brit Awards Classic FM album of the year. A chart-topping disc this is notable for taking its title from a modern waltz composed by none other than legendary Welsh actor Anthony Hopkins. Team that with the big selling Forever Vienna and you won’t go far wrong. 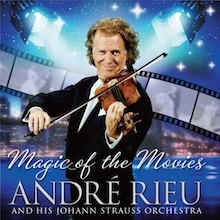 Discover André Rieu and have yourself what he calls a Strauss party. Strauss in the house. You could say this is the original dance music – and it isn’t going out of fashion anytime in the near future.